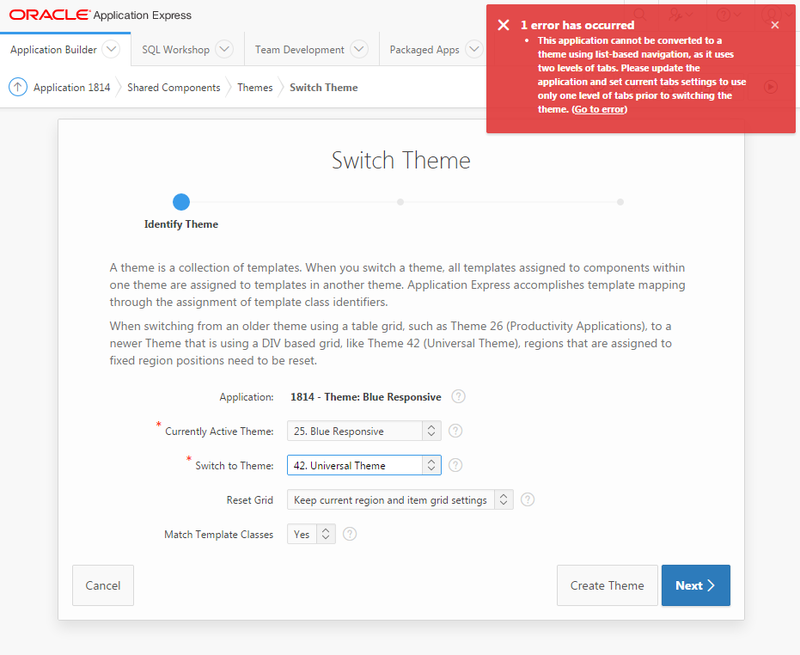 Warning: You must have at least two themes installed to be able to switch. Please create a new theme and attempt this action again. 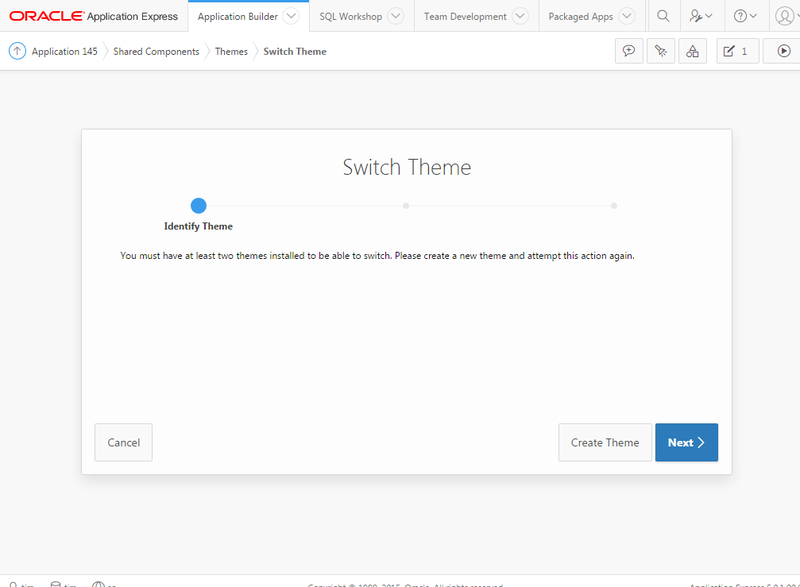 Create the Universal Theme in your application, as outlined above, before trying to switch your theme. Please start the guide from step #1. Because two-level tabs are not supported in Universal Theme, you must re-design your existing apps to use only one level of tabs, and then switch. If doing so proves too complicated, try deleting the parent tabs, conducting the theme switch, and then re-creating navigation using a navigation menu post. To delete the parent tabs, you must go to "Shared Components > Tabs > Edit Tabs > Manage Parent Tabs " and click on each of the parent tabs to access the button to delete them. 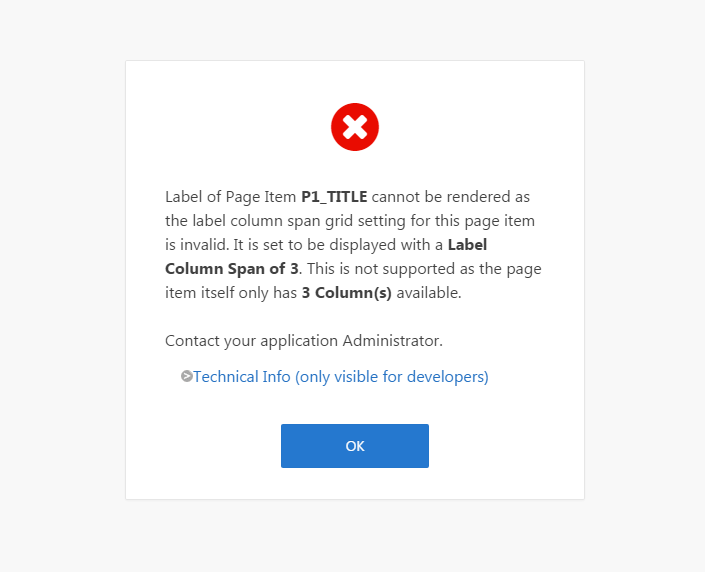 When running my app on a certain page, I get the error message "Label column span grid setting for this page item is invalid." In this example, with a label column span of 3 plus each item's column span of 1, all 4 together means that the content is 16 columns wide. This exceeds the 12 columns supported by the Universal Theme which results in this error being thrown before the page is rendered in your browser. To Fix: navigate to the page item specified in the error message in page designer or component view, and reduce the number of label column spans that your elements consume. If you reset all the grid positions that your app previously used, then your content will be placed in one column after upgrading. 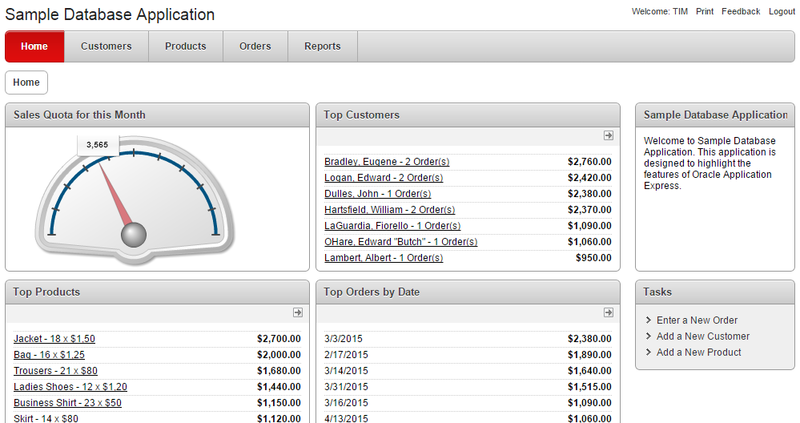 To recreate the columned layout you had before, just drag the regions into new columns with Page Designer. 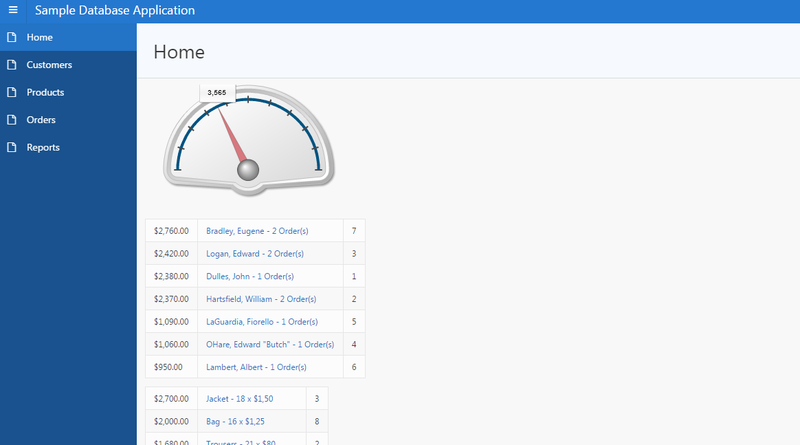 You can also "fine-tune" the grid and column spans using the right side bar to get a layout that resembles your original theme. In order to add menus and have fine grain control of your Navigation Bar, i.e., your upper right hand corner links, it will need to be converted from the "Classic" implementation to a "List" based one. To do so, you must first create a new list which contains entries such as your user name (nobody), a sign out link, and any other app-wide links you would like to have. Once this list is created, navigate to "Shared Components -> User Interface Attributes -> Edit Desktop -> Navigation Bar" and change the Implementation from "Classic" to "List". "Select the List you created earlier, and set List Template to Navigation Bar". Your app will now be using a list-based navigation bar. 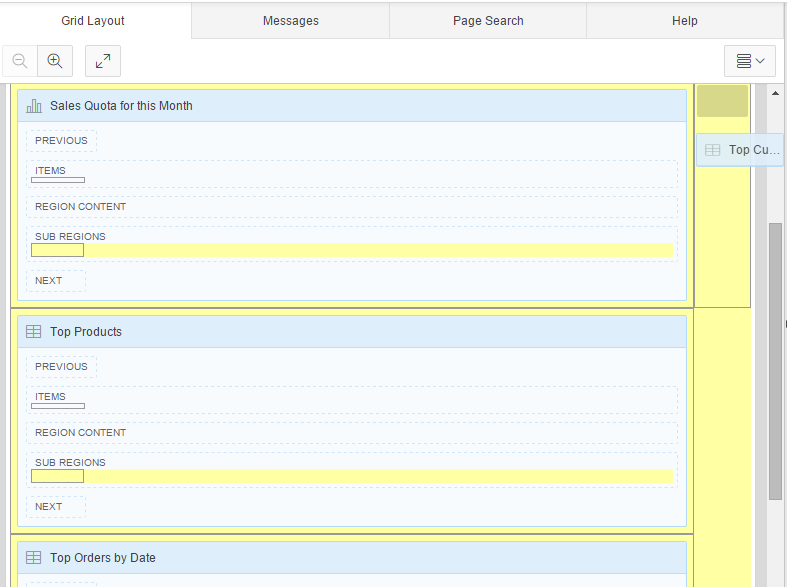 With a list-based Navigation Bar, you can then add sub-entries which will appear in a drop down menu.